Some are so steep they’re nearly vertical. Some cantilever from a wall ten stories off the ground, with no handrail. Some lead to the roofs of houses, while others lead nowhere at all. 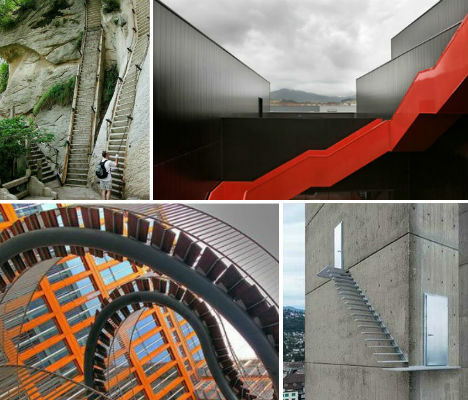 These 14 sets of extreme exterior stairs add visual interest to otherwise unremarkable buildings, enable hikers to scale mountains, make residential exteriors more functional and exist purely to delight and confuse. 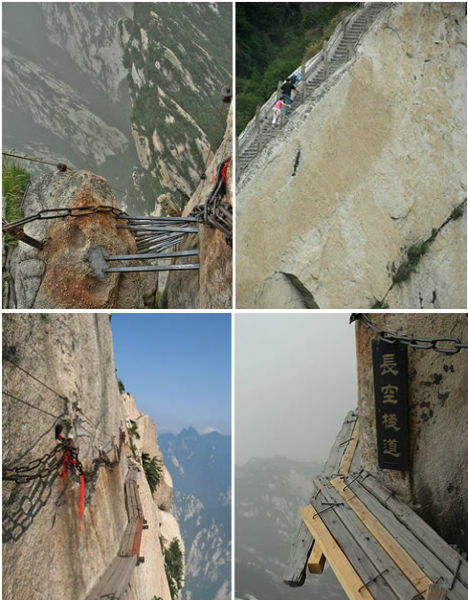 The highest peak of the sacred Huashan Mountain in China reaches a staggering elevation of 7,087 feet, and in order to even begin to scale this mountain, you’ll have to ascend dizzying, near-vertical sets of stairs built into the stone. But that’s the easy part compared to what comes next: insanely rickety-looking wooden boardwalks clinging to sheer cliff faces with nothing but some chain to hold onto. Building a home onto a steep mountainside can be a challenging proposition, but architect Alvaro Leite Siza came up with a clever solution for this modern residence in Penafiel, Portugal. 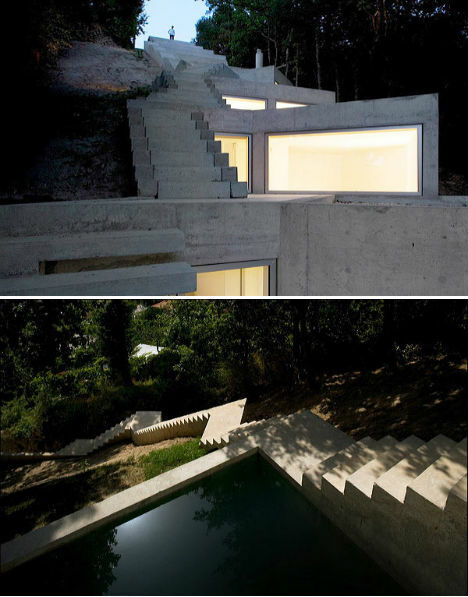 The Tolo House is a series of concrete volumes that cascade down the cliff – with a set of stairs running from one rooftop level to the next. Needing to connect the tops of two peaks, one of which was higher than the other, engineer Jürg Conzett and his associate Rolf Bachofner created a bridge that is also a staircase. 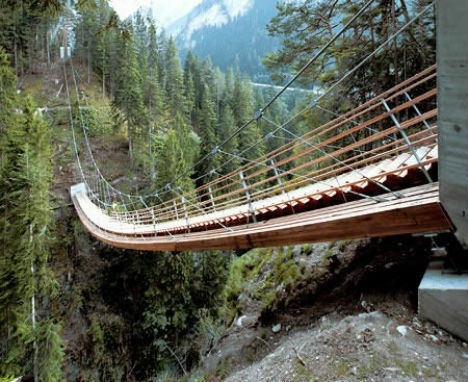 Replacing a rope bridge for hikers that was destroyed in a rockslide, the suspended bridge made of wood and steel spans a distance of 56 meters (183.7 feet) with a height difference of 22 meters (72 feet) between each end. This observation deck looking out over a landscape laid waste by coal mining is meant to be a stark sculptural landmark. 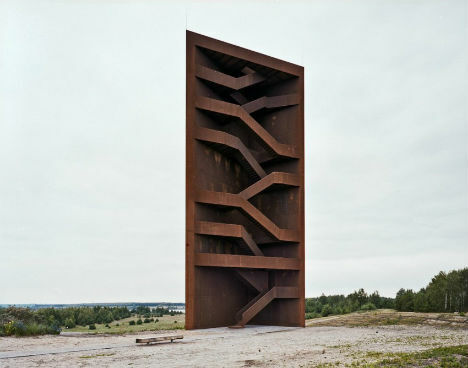 The structure basically functions as nothing more than a rusted-looking cabinet for a zig-zagging set of stairs that lead to the overlook at the top. You could climb these stairs for hours on end and never get anywhere. 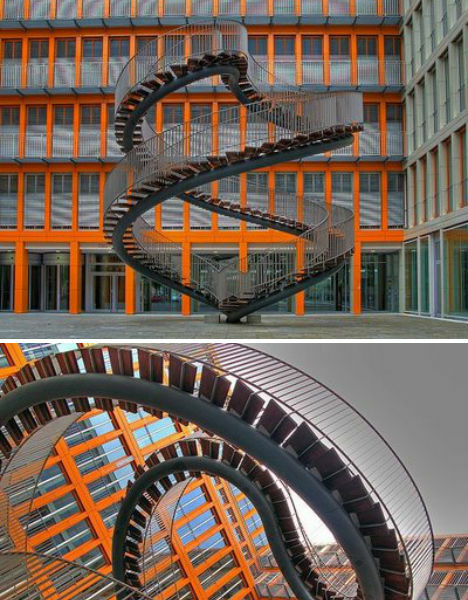 This set of ‘infinity stairs’, entitled Umschreibung (Rewriting), is an installation in the courtyard of the global accounting firm KPMG in Munich, by architect Olafur Eliasson. 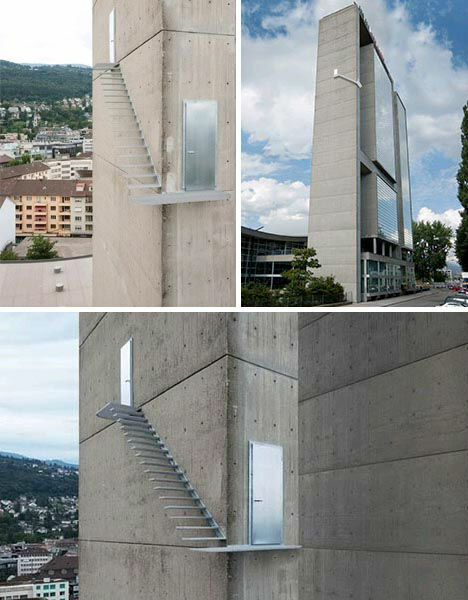 Would you dare to step out onto this set of exterior stairs, located ten stories off the ground on the side of a concrete Swiss skyscraper? 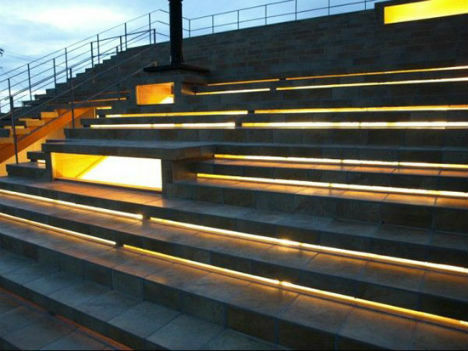 With no handrail, the stairs seem to present a deadly dilemma for people who need to get from one level to the next – especially those afraid of heights. But the attention-grabbing stairway isn’t actually functional. It’s an art installation by Sabina Lang and Daniel Baumann. 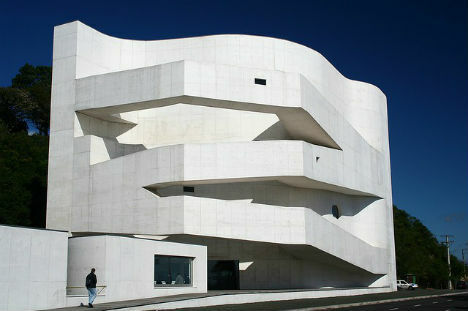 Considered a classic of 20th century modern architecture, the SESC Pompeii is a cultural center in Sao Paulo, Brazil. 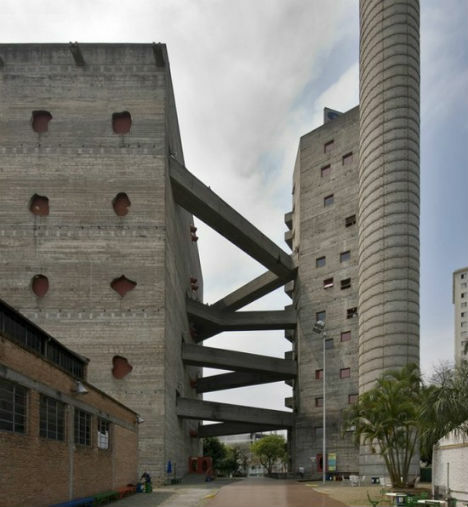 Designed by architect LIna Bo Bardi in 1977, the building’s most striking feature is its set of staircases connecting one volume to the next. 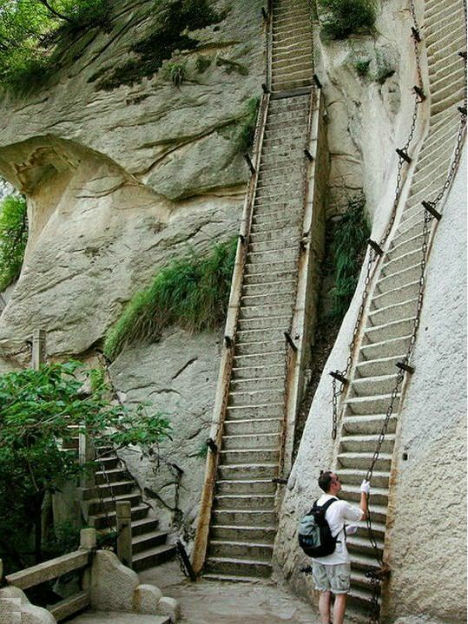 While these stairs will certainly make it easier to scale the side of Mount Hua in Shaanxi Province, China, than if there were nothing there at all, they’re certainly not for the faint of heart. This jagged, glossy red exterior staircase is just the right accent to liven up a backdrop of blocky, satin black buildings. 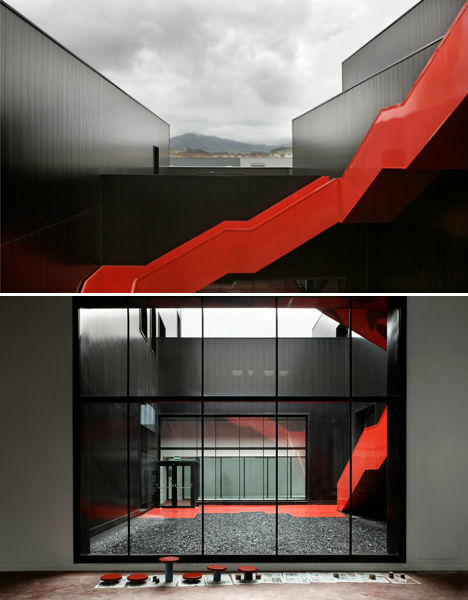 The head office of the Metal Foundation in Aviles, Spain by B Architects is a modernized warehouse on an industrial site, the staircase wrapping around it like a ribbon. 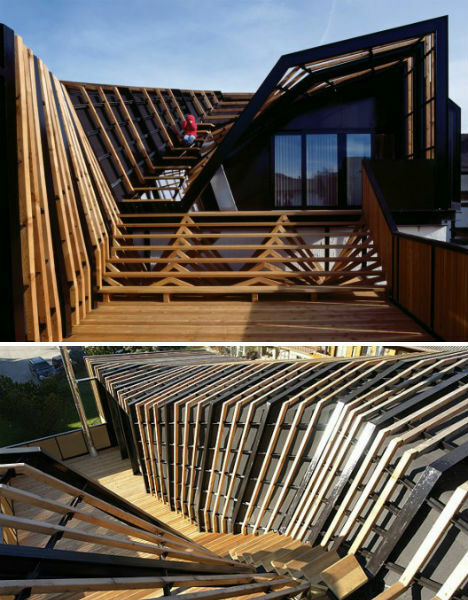 A simple wooden staircase leading to a rooftop deck blends right into the Foyn-Johanson House in Melbourne, Australia by Harrison and White. 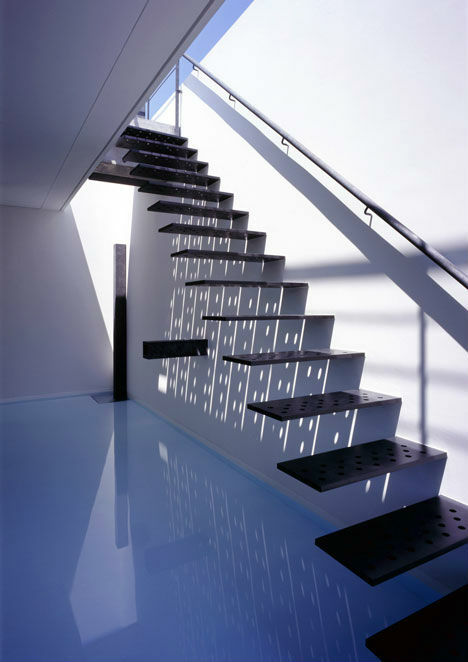 Some stairs are meant to be as inconspicuous as possible, meant only for functional purposes. Then there are staircases like this, which make a pretty white niche in the exterior of a home even more dramatic. The black cantilevered stairs contrast with their environment above a shimmering reflective pool. Named after a ‘stratified geo-formation’, the Esker House by Plasma Studio is a self-contained wooden residence built on top of an existing 1960s home. 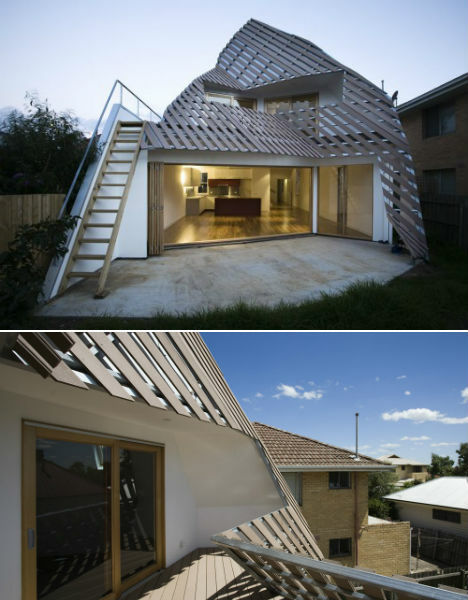 Initially conceived as a parasite, the structure gradually became its own ‘organism.’ The roof of the house is partially accessible through built-in stairs. You could be forgiven for taking a seat on these ‘bleachers’ and waiting for a game to start. Aside from the light that comes streaming between the steps at night, you would never guess that this structure is actually a house, built this way to give the exterior of the home extra functionality and preserve the privacy of the residents. A bold set of exterior stairs is the main visual component of the Ibere Camargo Foundation building in Porto Alegre, Brazil. Designed by Alvaro Siza, the large white concrete structure features three enclosed wings leading from one floor to the next.